The first principle of my blog is “Creating Ecosystems of Success”. I originally published this series on the Examiner back in 2014. As a teen I dreamt of being a basketball player just like a lot of kids – a dream for which one must have lots of ability, drive, and luck to achieve. 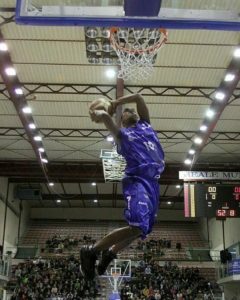 My experience turned out to be quite the adventure, and I didn’t formally play basketball beyond high school. The lessons I learned there however, not all of them happy and pleasant, helped me as I progressed into adulthood and into my Science, Technology, Engineering and Mathematics (STEM) career. 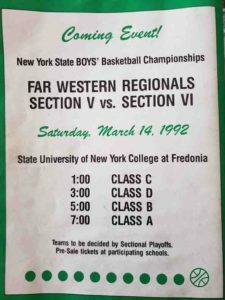 As mentioned when I began reposting this series, I’m working on an ambitious writing project chronicling my early basketball journey in Western New York. Initially I thought that I would simply republish the original series and let it go, but I’ve decided to add onto it as I continue working on my book project and ideas keep coming to me. 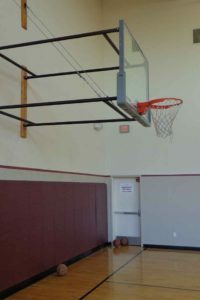 Heading into the summer months this particular follow up installment will discuss what I learned from the three years I attended basketball camp. 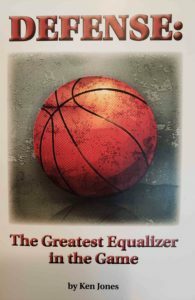 See if you the reader can pick up on the universal themes which transcend the great game of basketball. 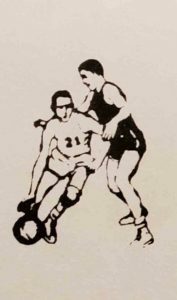 “Basketball is our game and yours can be the same,” was the signature quote of the Ken Jones Basketball Camp – the camp run by Dr. Kenneth Leon Jones, my first high school basketball coach. He told us students more times than I can remember, “I’m a student of the game!” He ate, slept and breathed the great game of basketball. Our basketball program at Hutch-Tech High School in Buffalo, NY was an extension of him and was unique in our league, the “Yale Cup”, during that sliver of time he coached there. He taught us the structure and fundamentals of the game which at that time were the hallmarks of only the area suburban and private schools. 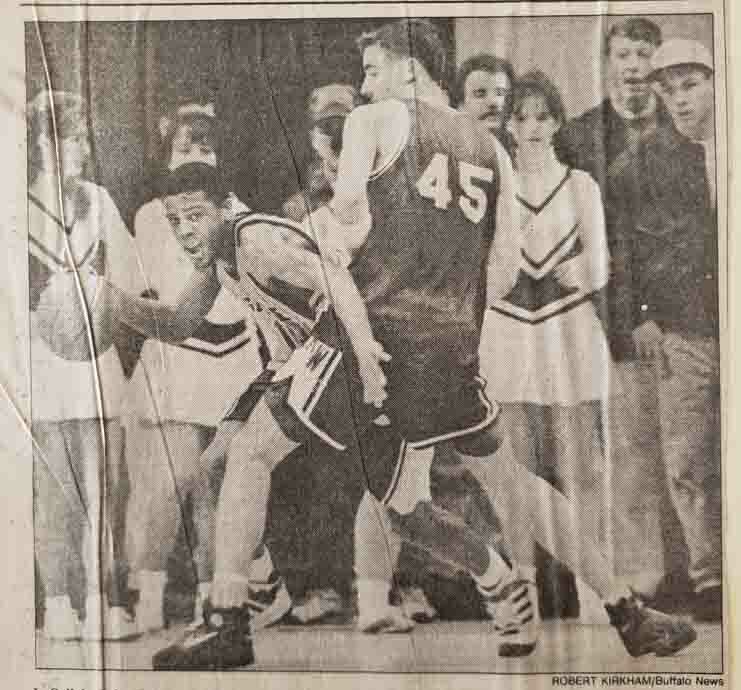 To learn some more about what the Yale Cup was like, see parts one and two of my interview with Buffalo basketball legend Jason Rowe. 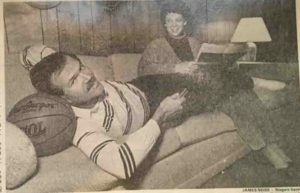 What was also unique about our program at Hutch-Tech was that our coach ran his own basketball camp – the first and only one I’d ever attend. 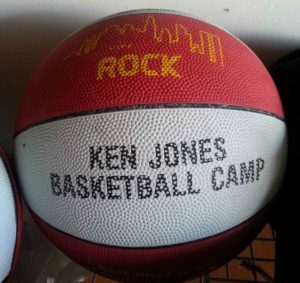 I first heard about the Ken Jones Basketball Camp as a freshman. 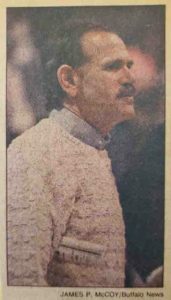 Towards the end of the 1990-91 school year, a highly successful season for Hutch-Tech’s basketball program, Coach Jones posted fliers for the camp on the bulletin board near the coaches’ offices. 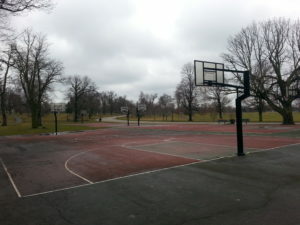 I knew very few fundamentals of basketball as most of my play consisted of games of “Twenty-One”, also known as “Rochester”, and ‘pickup’ games on Buffalo’s playgrounds and at the William-Esmlie YMCA. I thought attending the camp would not only teach me more about the game, but it would also give me an ‘in’ going into tryouts the next year – something it may have in fact done. I’ll point out here that my perception of attending the camp as an ‘in’ to get on the Varsity team was a flawed way of thinking. There were several peers who attended the camp and didn’t make the team during those years. For any prospective players or parents reading this, it’s very important for kids with aspirations of playing sports to understand that spots on their school’s roster should be, and must be, earned. Spots on the roster should be awarded based on skills and preparation – not some form of favoritism or partiality – both of which do happen in the real world at workplaces later in life. I was blessed that my mother and father were able to come up with the $300 to $400 fee to attend the Ken Jones Basketball Camp, as not all of my peers could afford to go. Keep in mind that I went three of my four years in high school – again a blessing. Also keep in mind that there were several local camps in and around the city of Buffalo which I didn’t know much about; which in hindsight, I also wish I had attended. Later in life I learned that no matter what your craft is, learning from multiple teachers only makes you stronger and more formidable. Each year the Buffalo News actually advertised all of the area camps, and neither I, nor anyone in my immediate family ecosystem at the time, knew to look for them. At this point I’ll distinguish between the two types of camps and if I’ve misspoken here, please do leave a comment below this blog post. According to what I’ve learned, there were two types of basketball camps; ‘Teaching’ camps which were designed to impart the fundamentals of the game, and also what I’ll call ‘All-Star’ camps – showcases for the nation’s top talent. These included the: Nike, Adidas, Reebok, and ABCD camps. These camps drew your future Division I and NBA talent. The documentary Hoop Dreams shows a snippet of the Nike Camp in the early 1990s where in that particular year, players like Chris Webber, Jalen Rose, Juwan Howard, and Alan Henderson attended. They were scouted by high-level college coaches like P.J. Carlissimo, Mike Kryzewski, John Chaney, Kevin O’Neil and others. 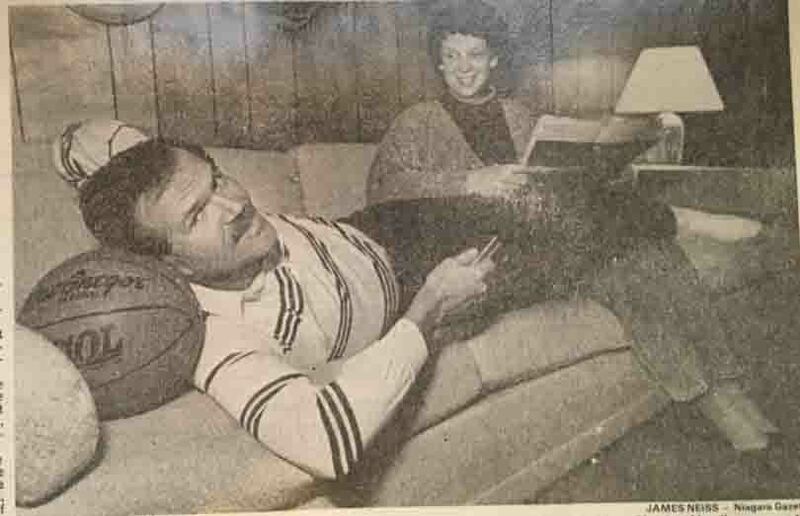 The Ken Jones Basketball Camp was a ‘teaching’ camp. In the early 1990s it was held at Hamilton College in north-central New York State. 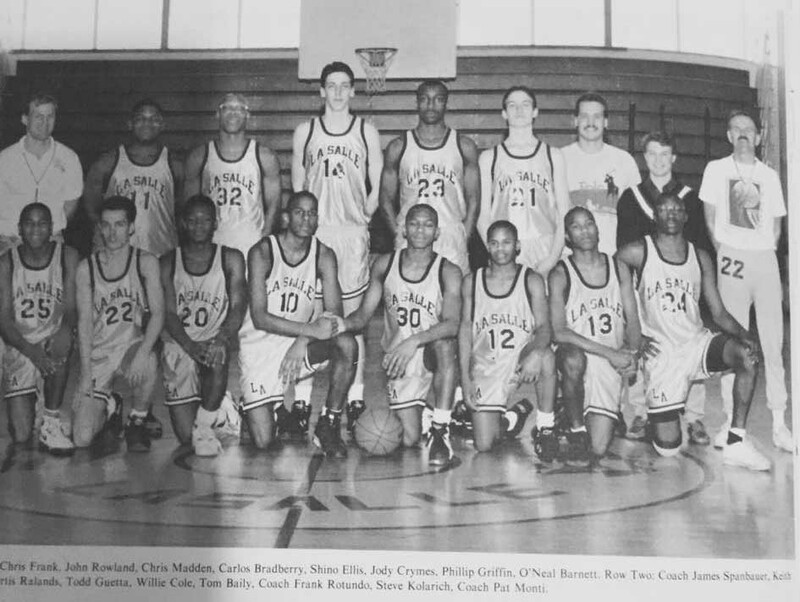 It drew kids from all over the state – some from the Buffalo area, and many from the Rochester area where Coach Jones used to coach before moving to Buffalo. There were also kids from the middle of the state and the Hudson River Valley. That was true for the coaches on staff too. 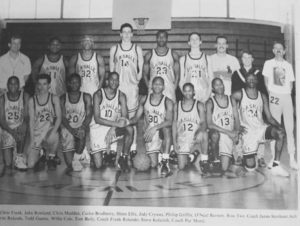 Coach Jones had an entire lineup of coaches he’d either coached with, coached against, or in many cases had simply befriended along the way. In a way they were like a group of ‘Mob Bosses’ like in the movie Casino. Instead of organized crime though, they were all passionate about basketball. You could hear and feel it in the workshops they taught in addition to how they coached us. “It’s a season of basketball in a session,” was one of the other signature quote from the camp’s brochure and it was true. It was one week packed with: workshops, drills, and competition. I’d never seen anything like it before. Towards the end of the camp there was a ‘playoff’ for each age group and an All-Star game for the camp’s best players. It was literally like a basketball boot camp. We had to be up at 6-7 am for calisthenics and stretching, and then breakfast to start our day full of games and drills/workshops. We were also supposed to be in bed at a certain hour each night. As promised, our muscles and joints were aching by Tuesday and Wednesday. It was a very ‘organized’ style of basketball they taught us there – very different than the ‘street-style’ we played in Buffalo which involved mostly, “going up strong to the ‘hole’,” and usually watching your teammates dominate the ball on offense while everyone else stood around watching – ‘isolation’ basketball. As I was going into the camp looking to become a much better offensive player, I was very much surprised by the amount of time we spent on defensive principles and fundamentals. 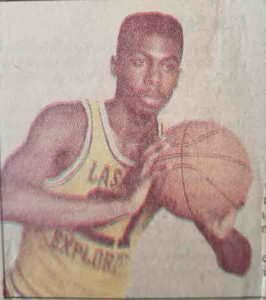 I also noticed that some of the other kids my age were much more developed than I was in terms of their offensive skill sets and their overall ‘basketball-IQs’ – their basic knowledge of the game allowing them to know what plays to make offensively and defensively – instinctually in some instances. One teammate from my first year at the camp who was from Palmyra-Macedon (Pal-Mac) High School in the Rochester area stands out to me. We were the same age and similar height, but he had already developed a reliable 15-foot jump shot – something I hadn’t developed at that point as no one had emphasized it back home. Interestingly, the best basketball I ever played was probably at that camp my second year. I think it was largely due to the players I got to play with. They weren’t selfish, ‘me first’ players. The guards were disciplined and they looked to share the ball. At the camp going into my junior year of high school, I remember regularly touching the ball on my team, and making the All-Star game at the end. What I’m going to say next is probably the most important part of this piece. I didn’t know how to actually harness what I had learned from the camp, and make myself a better player. That is, I didn’t understand that simply going to the camp by itself wouldn’t make methe best player I could be. Afterwards, it would take hours and hours perfecting those fundamentals, and then learning how to use them in actual competition. This is the actual “development” – something that takes time, focus and commitment. When I look back on those years, I also realize that I was also developing on my own. In a game like basketball, if you want to play at the highest levels, you have to not only develop yourself personally, but you also have to figure out how to coalesce and build chemistry with the group of players you’re going to be playing with in competition. What I didn’t understand at the time was how to break out of my ‘comfort zone’. As you might imagine, the majority of the kids at the camp weren’t black, and as an inner-city kid I didn’t know how to blend with kids who didn’t look like me – befriending them and asking them to show me what they knew – also learning about their basketball and life experiences. Making new friends was encouraged, but I just didn’t know how to do it. This was also prior to the cell phones, social media, and the technology we have today, so I didn’t think to try to befriend and stay in contact with the other kids long-term. Probably the last important principle I didn’t understand was that becoming a great basketball player involved combining the ‘organized’ and ‘street’ styles. The reason I played my best basketball at the camp was because I had become used to playing the ‘organized’ style. A teammate at Hutch-Tech likewise told me later that my game was ‘basic’, meaning that it was very technically sound and very ‘textbook’. I thought he was picking on me as per usual, but he was right. It turned out that the great and transcendent players at any level could play within an organized team structure, but could also play off of pure instinct when necessary – creating shots for themselves or teammates, or creating key turnovers on defense – again all off of instinct. All of this takes any player time, effort and focus, and it should come from within the individual in order for it to truly bear fruit. “Damn Anwar. You spent all of that money to go to basketball camp,” a classmate said to me as my junior year season fell apart due to injuries and grades. He was pitying me, and or gloating – I couldn’t tell which at the time. I wasn’t originally going to put this quote into this piece, but it’s a critical aspect of my book project because it underscores how peers view you when you’re setting out to do something of meaning and value. Some are happy for you, while some are waiting for you to fail. And again, not every family had the money to send their kids to camp which probably created some envy. Some kids wanted to play on the basketball team and didn’t for whatever reason. When you’re a player on a team, you don’t know how your classmates and peers are viewing you and your opportunities until you yourself are going through a hardship of some sort. This also underscores the importance of having the mental strength I discussed in part three of this series. And I think I’ll wrap this up here. As I’m working on my book project, all of the things I didn’t know from that time are coming to me – things those in my own immediate familial ecosystem didn’t necessarily know to stress to me at the time – things which the highly successful players are and were taught at those critical stages of their development. This piece is thus highly valuable of young players in those stages. I have a cousin like that right now who thinks she wants to be a basketball player. This piece is very much for players like her who are good on defense for example, but need to develop their offensive games to go to that next level. If you’ve found value here and think it will benefit others, please share it and or leave a comment. 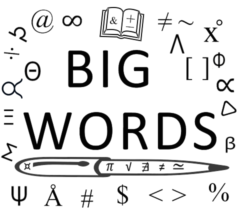 To receive all of the most up to date content from the Big Words Blog Site, subscribe using the subscription box in the right hand column in this post and throughout the site, or add the link to my RSS feed to your feedreader. Lastly follow me on the Big Words Blog Site Facebook page, on Twitter at @BWArePowerful, and on Instagram at @anwaryusef76. While my main areas of focus are Education, STEM and Financial Literacy, there are other blogs/sites I endorse which can be found on that particular page of my site. 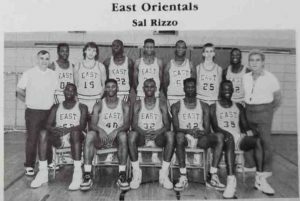 This interview is the second part of my interview with Buffalo basketball legend Jason Rowe. 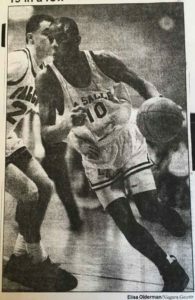 In the first part of our interview we discussed his background, and the run he and his teammates went on at Buffalo Traditional High School in the early- to mid-1990s in our city league, the ‘Yale Cup’ and postseason play. 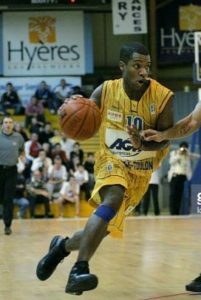 In the second part of the interview we discussed his basketball career after Buffalo Traditional – college, the professional level, and now his current experiences coaching in Western New York. The pictures in this post were shared courtesy of Jason himself. Anwar Dunbar: It’s been documented that academics prevented some Yale Cup players from going to big time Division 1 schools. What kind of student were you at Buffalo Traditional? Jason Rowe: I was a ‘Merit’ and ‘Honor Roll’ student. If I wasn’t, I wouldn’t have been able to play. My parents instilled education in me from day one. My mother and father were constantly on me about grades. If my grades weren’t above a certain GPA, then I wasn’t allowed to play basketball. My father actually took me off the ‘Modified’ team at Traditional for half the season because my average was an 87% and not a 90% or better. So in no way shape or form would I say that Buffalo Traditional didn’t prepare me. No!!! My parents prepared me and instilled how important my education was. AD: That’s actually a big deal. I saw that happen to a couple of players at Hutch-Tech. It seems that if your parents don’t set that high standard, you’ll do just enough to stay eligible to play and, in some instances, just walk that line of eligibility as I did in some classes. When did the colleges start recruiting you? Were you a sophomore or a junior? Or were they looking at you as a freshman? JR: I was a sophomore and it just blew up out of nowhere. I remember my first two letters were from Duke University and the University of Michigan. They were ‘generics’, but you couldn’t tell me that I wasn’t being recruited by Duke and Michigan. AD: How did it feel? JR: I thought I was the king of the world. Even though they were questionnaires, these were the guys that were on TV. These were Coach Steve Fisher’s (Michigan) and Coach Mike Krzyzewski’s (Duke) signatures right there so it was a big deal. AD: Where did you end up going? AD: Why did you choose that school? JR: It felt like home. I got injured at the ‘ABCD Camp’ and a lot of teams didn’t know how serious it was. My back was just ruined. A lot of schools wanted me to sign ‘late’, but I didn’t want to sign late. My mentality is if you want me, you want me now. I didn’t want to wait for them to figure out if another kid was going to sign. I was second or third on a number of college’s boards, but if you say you want me then I felt like, let’s get this thing done. Let’s figure it out. I wanted to focus on my grades and winning the state championship, so I didn’t want to go the whole season with phone calls and distractions. AD: So signing late is something colleges want you to do when they’re unsure of your health? JR: All schools have a list of about five to ten people at your position, and it’s in order of how much they want them. I was two, three, or four on a couple of lists, and I wanted to be their number one. If they wanted me, I wanted to make it happen. I didn’t want to wait for someone else to not sign for them to want me. In my brain, that meant they didn’t want me. AD: So it’s kind of like dating (laughing). AD: What were the biggest adjustments you had to make from playing at Buffalo Traditional to playing on the college level and being away from home? JR: I had family in Maryland so being away from home wasn’t an issue for me. 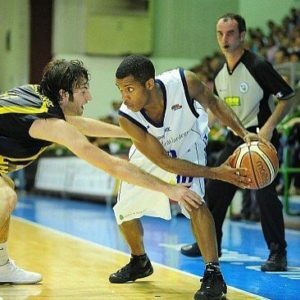 The biggest issue for me was learning the point guard position because in high school we didn’t have any plays. In college now it was about game management – knowing what’s a ‘good’ shot, knowing what’s a ‘bad’ shot, and how to keep your teammates happy. There were so many things that I was lacking that I had to pick up very fast. AD: Interesting. So when you were at Buffalo Traditional and an opponent threw up a ‘2-3’ or a ‘3-2’ zone defense against you, how would you all approach that if you didn’t have plays? JR: We knew what to do whether it was running a ‘Motion’ play or a ‘Pick and Roll’. We felt like we were so talented that we could figure it out anyway. We had athletes, ball handlers, big men, and shooters. We had everything so we could chuck up a shot, and with Adrian, LaVar, and Damien – someone was going to get the rebound (see part one of this interview). We could get a three-pointer if we needed it – enough of us could shoot three-pointers. It was sort of like ‘fool’s gold’ because you could get away with it at the high school level, but at the college level, that’s not how it works. 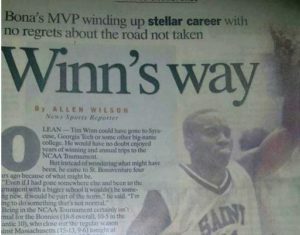 AD: So in college you had to learn how to play the point guard position from more of an Xs and Os standpoint. JR: Yes, I had to learn how to play basketball. AD: Did you play all four years? JR: I played three and a half. I left halfway through my senior year due to grades. 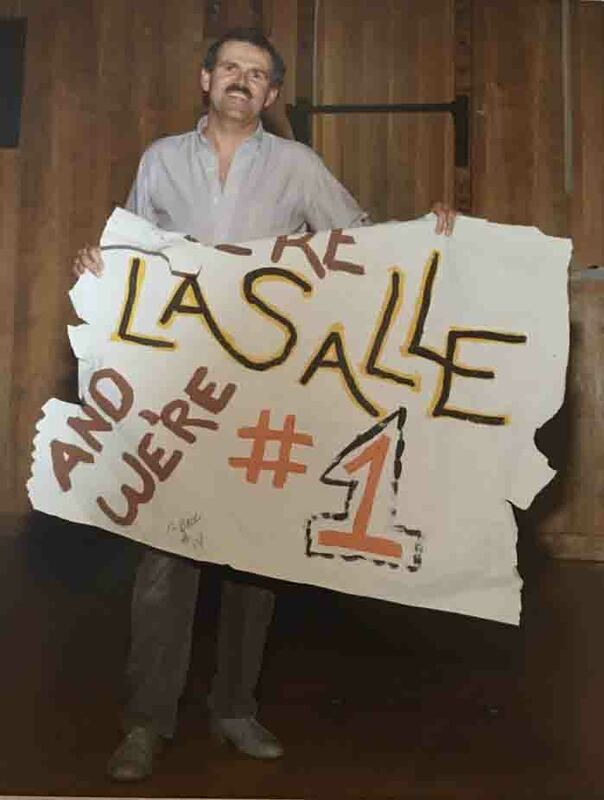 AD: When I was an undergraduate, I do remember sitting in my dorm room one day and seeing Loyola of Maryland on ESPN, and seeing you suited up in your green and white uniform. What did you major in? AD: Did you just encounter a hard series of classes, or was it just juggling being a Division 1 student-athlete? JR: There was a lot going on in my personal life and I didn’t know how to handle things. AD: At any point did you dream of playing in the National Basketball Association (NBA)? JR: Yes, for a very long time. For anyone who plays basketball long enough, that’ s going to be a dream – especially someone who studied it, watched it, and idolized players in the NBA. 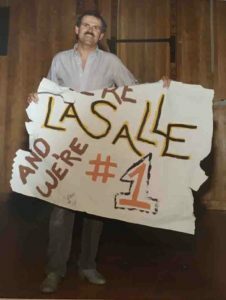 AD: In any of your years at Loyola, did you guys make the ‘Big Dance’ (the NCAA’s Men’s College Basketball Tournament)? JR: The one basketball thing that drives me crazy to this day is not experiencing the Big Dance. Anything else that goes on in basketball is fine, but not playing in the Big Dance drives me insane. 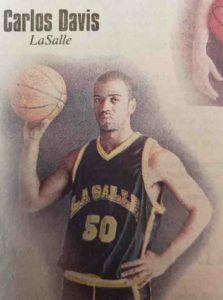 AD: How did you go from playing at Loyola of Maryland to playing professional basketball overseas? JR: It was through an agency. My college coach gave me a ton of agent letters – dozens and dozens of them and I literally went through all of them, researched them, and figured out which one worked best for me. 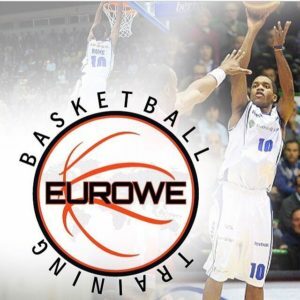 I literally had an interview process with a couple of agencies and picked an agent that would best help me to further my career overseas and further my basketball career in general. AD: So you must have done exceptionally well at Loyola for agents to have wanted to sign you. JR: Prior to my leaving school, I was actually projected late first round and late second round going into my senior year in the NBA Draft. When word gets around, you’ll have agencies calling. AD: What kind of numbers were you putting up? Were you putting up ‘Triple Doubles’? JR: I’m trying to remember – my senior year, I was around 25th in the country in scoring, 15th in assists, and 3rd in steals. 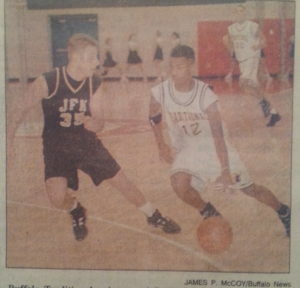 In my junior year I was 2nd or 3rd in steals, and in my sophomore and senior years it was similar. 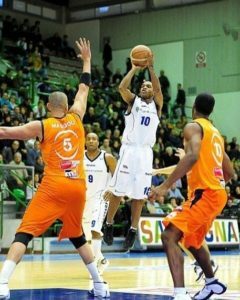 AD: What was it like playing professional basketball overseas? Which club or franchise did you play for? JR: I played in 11 countries for 18 teams. I played 15 years and I don’t regret a thing. It was beautiful. AD: Wow. So this was all over Europe? JR: I’m going to try to do it in order. I played in: Cyprus, Israel, Poland, Argentina, France, Italy, Turkey, Spain, Ukraine, and Morocco. AD: So you were playing against home-grown European players, as well as players from the United States too? Which names come to mind? JR: Yes. 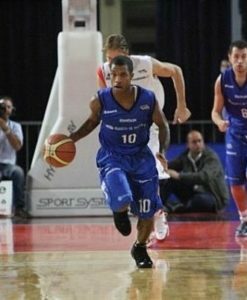 When I was in Turkey, I played against Allen Iverson. 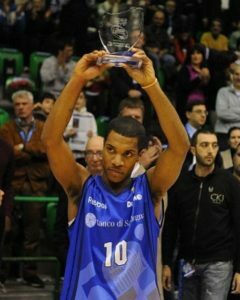 In Italy, I played against Danilo Gallinari and Khalid El-Amin. 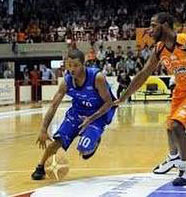 In France, I played against Hollis Price. C.C. Harrison had a big name. I played against Rudy Fernandez when I was in Spain. Lamar Odom signed to a team in Spain, but he didn’t play that night. Manu Ginobli, Marco Bellinelli – I played against those guys. I played against Troy Bell who I’m still friends with. I played against a lot of people. AD: I remember you posting a picture of you playing against Allen Iverson, also known as ‘The Answer’ on Facebook. What was it like playing against ‘A.I.’? AD: There was always some controversy about whether or not he was 6’. JR: He’s not 6’ (laughing). AD: Okay, we’re almost done Jason. One of the common themes in my interviews with some of the former Yale Cup players is wasted and underdeveloped talent. The Buffalo News actually wrote a series of stories on this during your junior year at Buffalo Traditional. With players like you and Damien Foster taking your basketball careers beyond the Yale Cup, what are your thoughts on the challenges of our city league and that era? We didn’t have a solid Junior Varsity program like the suburban and private schools, and most of our ‘league’ games were immediately after school. There were just so many differences between what we had versus the suburban and private schools. Talk about that. JR: I think that’s a valid argument. Our games at Traditional got moved to 7:30 pm because they were so popular. Being a coach now myself, I do think the development is completely different. I’m in a private school right now – Bishop Timon. The things that I have access to, public schools don’t have access to, and what you said was perfect regarding the development of a Junior Varsity team. Having access to the gym and being able to develop my kids in a particular type of way that public schools don’t have access to – I think it’s unfair, and because of that I think you see the difference between public schools and private schools. One is structured and one doesn’t necessarily have the same structure, because they’re not allowed to do certain things. Because of insurance or whatever the reason is, you see this big difference immediately, and in terms of athletics, I think something needs to be done about that. AD: Is that something the School Board would have to address? JR: Yes, because from my understanding, the biggest issue is insurance. That’s what I was told. I’ve always wondered why some schools have access and other schools don’t. It’s unfortunate because for a lot of these kids, athletics is their way out of their toxic situations. So why not have things in place for them to look forward to? If they know that there is an adult or adults who are there in the gym to help develop their minds and bodies to give them a place of peace and tranquility, why not do that? Why not develop these everyday life skills, instead of having these kids with nowhere to go, and no access to anything, and now they’re doing something they don’t need to be doing? I would love to sit in on one of the meetings and get to the bottom of why these things aren’t happening. 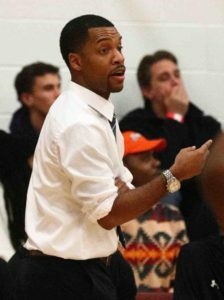 AD: I’ve heard you DJ at Dennis Wilson’s Oak Room, but you’re coaching now yourself at Bishop Timon. After your long playing career, how are you enjoying coaching? JR: I love it. To be honest, coaching wasn’t something I was looking forward to – I just wasn’t into it. I don’t like stress – the yelling and the screaming. I’m actually a calm coach, and my kids think it’s hilarious. I don’t yell and I don’t scream and yet I know how to get my point across without demeaning or belittling the kids. That works for me, and I relate to my kids the best way that I can and it’s working for our team. We’re having huge success this year. I’ve tried to take my experience from playing for four different coaches and meshing everything together to come up with my own coaching style. AD: So you’re not a ‘yeller’? JR: No, not at all, and I get that from my mother. I just give the kids a look and they know when I’m serious or something wasn’t done right. I also demonstrate – I get in the practices and in the drills because I think it’s pointless to tell the kids they did something wrong and not show them the right way. That works for me, and now the kid doesn’t make the same mistake twice. I’m very, very hands on. AD: How are the kids today different from 20 years ago? JR: I do training as well, and I’ve been fortunate enough to have a lot of hardworking kids. I think the era as a whole is more concerned about how people view them as opposed to actually getting into the gym and working. I think kids are worried about rankings and social media ‘likes’. Granted it’s a 20-year difference. We didn’t have a phone to let the world know we were in the gym working out, so their mentality is different because they have access to different things. My kids know that when it’s time for practice and training, they have to shut their phones off. When it’s training time give me an hour, and when it’s practice time, give me two hours. After that you can do you what you want to do, but lock into this and we’re fine. AD: That’s true. We didn’t have Facebook or YouTube twenty years ago. AD: Does that mean when you are at Buffalo Traditional, you guys didn’t look at the Buffalo News weekly ‘News Cage Poll’ to see if you were ranked over Cardinal O’Hara, Burgard or John F. Kennedy? JR: Of course, but as a retired player, a coach and a trainer, I understand that those don’t mean anything. You still have to go out and perform, and do what you need to do. 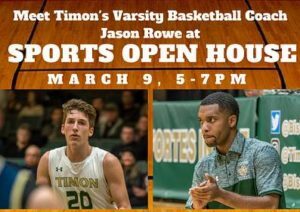 AD: Is there a difference between the kids you have at Timon versus what you would have if you coached in the Buffalo Public School system (BPS)? JR: No. I was doing training and I had BPS kids. What works for me is that I respect them and they respect me. 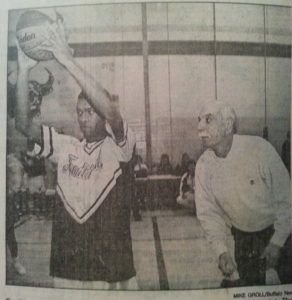 Fortunately, I played basketball a long time and I can help them get to where they want to be in terms of this game. Because of that I’m able to keep their attention for an exceptional amount of time. I’ve gone where they want to go, so if was in the BPS I don’t think it would be a big issue. AD: Is there anything you would change about your playing days? JR: I would say not failing out of school, finishing my degree and my senior year at Loyola of Maryland. Otherwise, I enjoyed every single time I stepped onto the basketball court – high school, college, rec-center, international – every good game and bad game – I wouldn’t change a thing in terms of my basketball career. AD: For youngsters aspiring to play basketball or to achieve any other life goal, what advice would you give them? JR: Enjoy the moment. Enjoy the moment and take it seriously. Understand that every decision you make affects the next thing that you do. When I left school, it affected me possibly not being drafted which led to me going overseas. And I’m grateful to have gone overseas and to have played in fifteen countries, learned so many things, played against so many people. I was able to accomplish so many things and see the world with a basketball which is something I never thought would happen. But I didn’t understand the effects of decision making. You’re a kid and you think you’re invincible. You leave school, but you don’t understand how much of a domino effect it is, and how one decision affects everything that you do afterwards. It can alter everything in your life, so my advice to youngsters is to really understand the decisions that you’re making with everything you do in life. AD: Yes, one injury, a violent crime – anything can change your future. I’m sure you saw ESPN’s 30 for 30 about Benji Wilson’s life. He was the No. 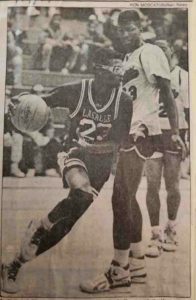 1 high school player in the United States in 1984, was on his way to being a college star and then a professional basketball player. And it was all taken away just like that over a stupid argument with two guys on the street he didn’t know, and who had nothing to lose themselves. JR: When I was in high school I didn’t go out. When I was at Loyola, I didn’t go out to a club until maybe my junior year. I was afraid of losing my scholarship due to being in the wrong place at the wrong time. I went to dorm parties, but I didn’t want the club scene. I didn’t want it. AD: Well Jason, thank you again, and I really appreciate your willingness to talk about your life and playing days. Whether you know it or not, you are royalty, at least as far as I’m concerned. 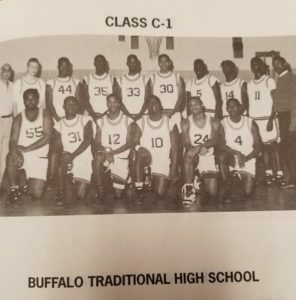 What you guys did at Buffalo Traditional was big and in your successes, you touched a lot of lives – not just at Buffalo Traditional, but also for the rest of us at the other schools – seeing that those types of things could be done and giving everyone else something to shoot for. 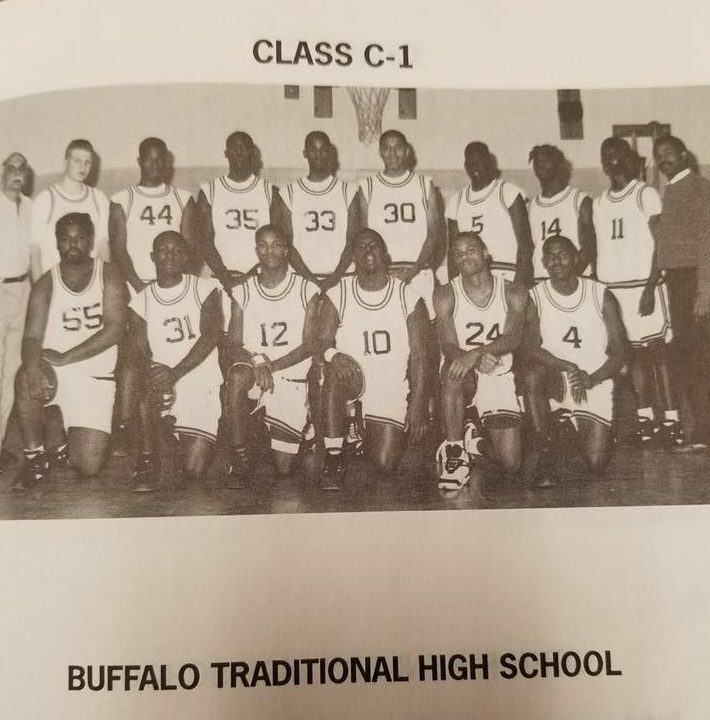 It was something for the entire area to be proud of – to say that you were there, and that you played against Jason Rowe, Damien Foster, and the Buffalo Traditional Bulls (click on the image below to enlarge it). JR: You just said something very important, which was that we touched lives. At the time you don’t understand that, but that’s why I also said for the youngsters to be mindful of their every decision because you never know who is watching. That was something that I learned later on in my career – to be mindful, to be in the moment, and to appreciate each moment. There is nothing wrong with stepping outside, smelling the air and saying, ‘Thank you.’ Don’t get caught up in getting flashy rings, a Range Rover and all of those things, because all of that can be taken away from you. If you’ve found value here and think it will benefit others, please share it and/or leave a comment. To receive all of the most up to date content from the Big Words Blog Site, subscribe using the subscription box in the right-hand column in this post and throughout the site or add the link to RSS feed to your feedreader. Lastly, follow me on the Big Words Blog Site Facebook page, on Twitter at @BWArePowerful, and on Instagram at @anwaryusef76. While my main areas of focus are Education, STEM and Financial Literacy, there are other blogs/sites I endorse which can be found on that particular page of my site. One of the key principles of my blog is “Creating Ecosystems of Success”. A key pillar of creating them is hearing the stories and experiences of those who have made it to where we want to be. Like many kids, an early dream of mine was to play basketball. 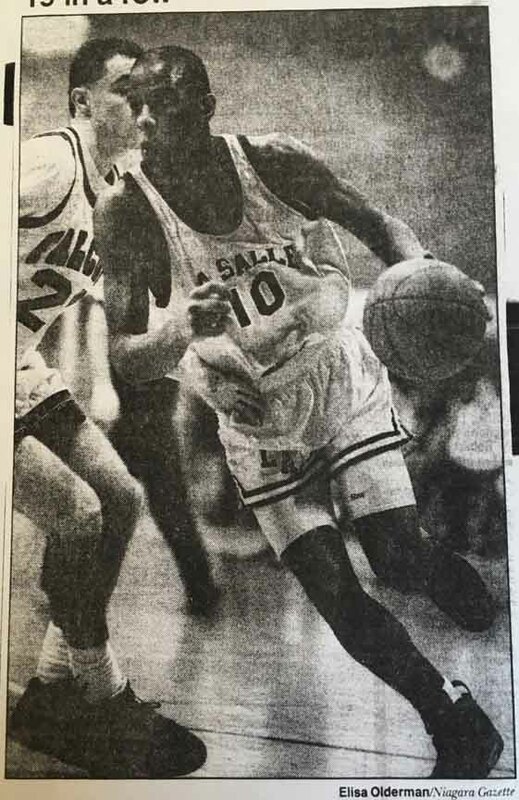 That dream didn’t reach fruition, but the lessons I learned playing in the Buffalo Public Schools’ ‘Yale Cup’ high school city basketball league laid the groundwork for me to go on to further my education and start my science career. I’m actually working on a project chronicling my early journey, and as a part of the research for that project, I’ve interviewed numerous Yale Cup players from my era. 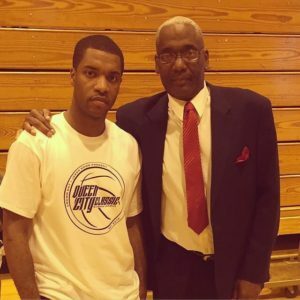 On February 2, 2018, I had the honor of interviewing Jason Rowe – a Buffalo basketball legend who sits on the ‘Mount Rushmore’ of Yale Cup players with the likes of: Trevor Ruffin, Ritchie Campbell, Marcus Whitfield, Curtis Aiken, Ray Hall and Cliff Robinson. 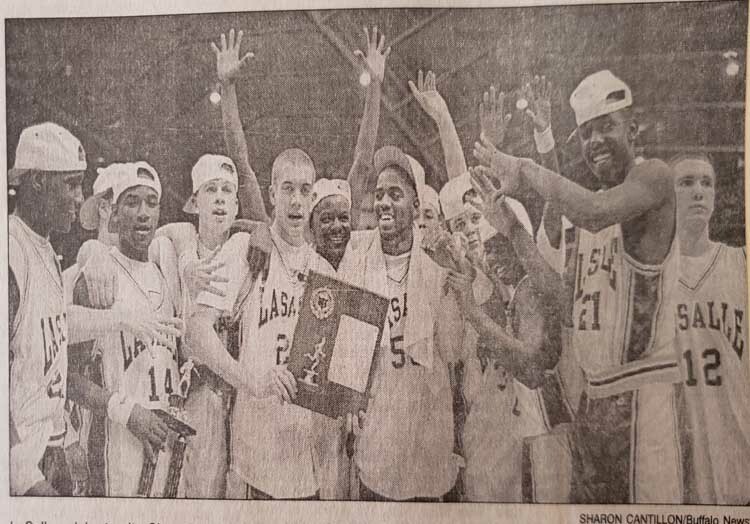 Jason spearheaded Buffalo Traditional High School’s ascension to the top of ‘Section VI’ basketball, leading his Bulls to the ‘Far West Regional’ each of his four years, and then to State Tournament in Glens Falls, his final two before winning it in his senior season. 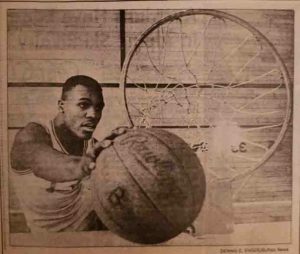 In part, one of this two-part interview, we discuss his background, and his storied playing days at the Buffalo Traditional High School. The pictures in this interview come from an archive of Section VI basketball assembled over the years from issues of the Buffalo News by my first Coach at Hutch-Tech High School, Dr. Ken Jones. Anwar Dunbar: Thank you for this opportunity to interview you, Jason. 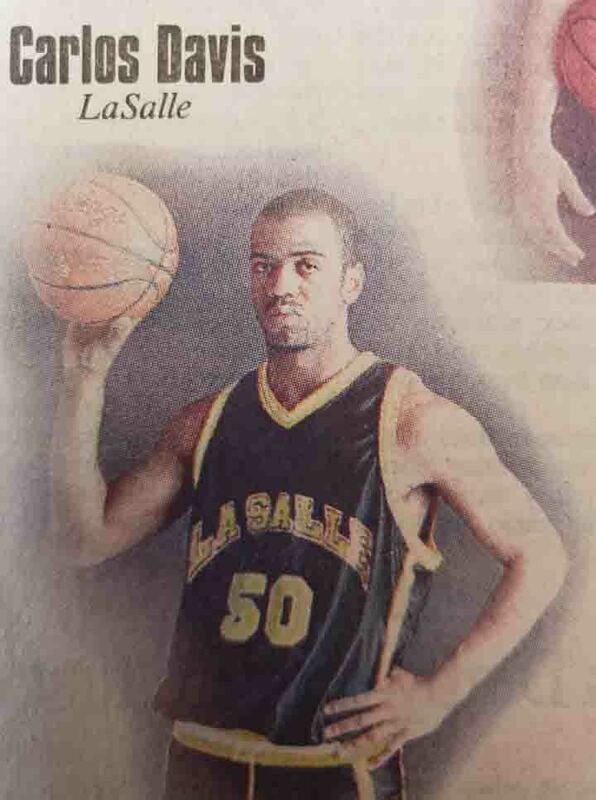 I’m working an ambitious writing project about my high school basketball experience. It was my first major success and failure life lesson. 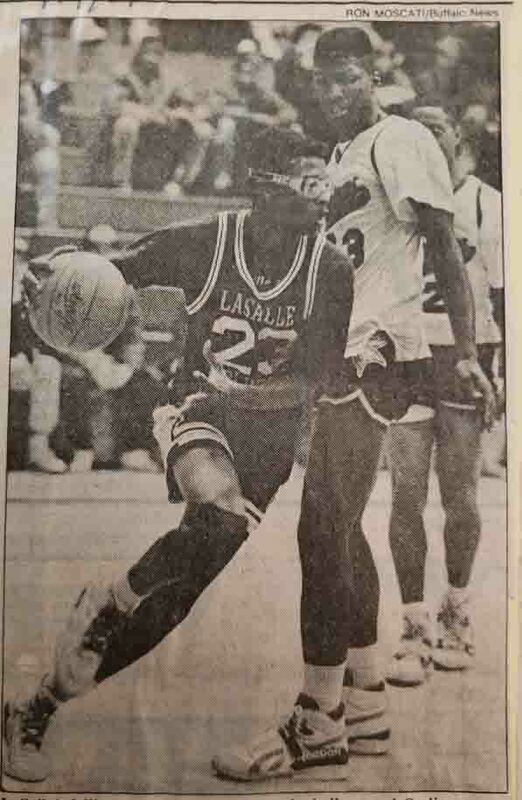 While I didn’t play organized basketball beyond the 1993-94 school year, my high school experience on our team at Hutch-Tech gave me the tools I needed to earn my Ph.D. in a STEM-field – not quitting during the hard times, dealing with adversity, finishing what I started, and so on. In my project I also tell the story of the Yale Cup in that era, and you can’t properly tell it without discussing the Buffalo Traditional Bulls as you guys were the premiere program/team. As a part of my research, I’ve reached out to some of the other Yale Cup players to gain insight to what it was like playing at Bennett, City Honors, Kensington, Riverside, and others. But to talk to you is like talking to Jordan (laughing). Jason Rowe: That’s a lot of pressure (laughing), but I’m happy to help out. AD: Okay, so let’s start. As you know, the Buffalo News wrote extensively about you in the early to mid 1990s. They particularly talked about your father, Jerry, and your Uncle Lester being very influential in your development as a basketball player. At what age did you start playing basketball? Did they put a basketball in your crib as a baby? JR: It’s funny you should say that because that’s literally the story I was told. When I came home as a baby, there was a basketball hoop on the wall in my crib and my father used to pick me up and have me dunk the basketball as a kid. AD: Was your father a basketball player? JR: Yes. He played locally, but he didn’t pursue it at a higher level. My uncle and I were the ones who were fortunate to go on to play in college, and to make some money from it. AD: So you would describe your upbringing as being similar to that of a Stephon Marbury where basketball was literally in your family? JR: Yes. All of the males in my family – myself, my uncle, my father, and James Rowe my cousin, who was an athlete at Lafayette High School. He played football, basketball, and I believe he ran track too. My brother, Jeremy, played football, basketball, and he ran cross country at Buffalo Traditional. My whole family was athletic. 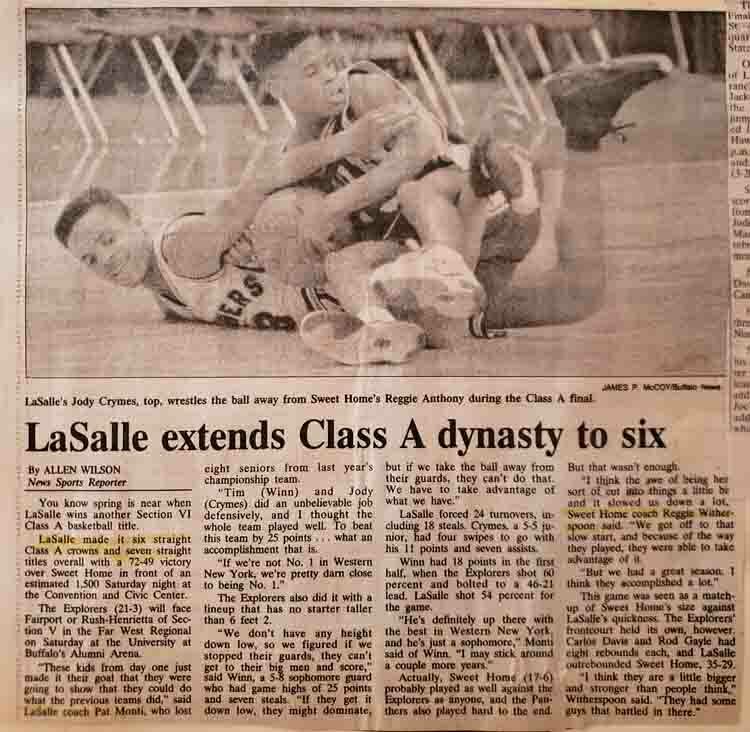 AD: When you were playing middle school basketball, were you already in camps and clinics? JR: I went to the University of West Virginia’s basketball camp as a kid. I went to the local camps at Canisius and the University at Buffalo. 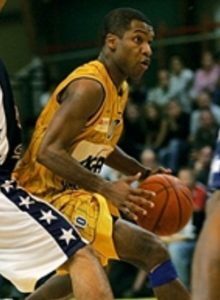 I was actually at Georgia Tech’s camp the moment Kenny Anderson got drafted into the National Basketball Association (NBA). 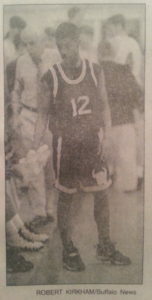 As a kid I was a huge Kenny Anderson fan, and that’s why I wore number 12 in high school. AD: Were there any other college and professional players that you looked up to? JR: Jordan, Isaiah and Magic were the guys that I idolized in the NBA. In college I looked up to Kenny Anderson, Jason Kidd and Chris Jackson. 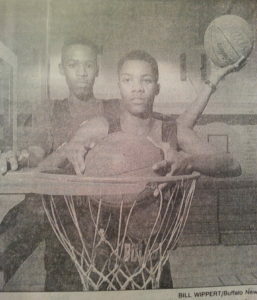 Locally, I looked up to my uncle, Trevor Ruffin (pictured to the left), and Ritchie Campbell. I looked at them and felt like I could do something. They were guys I could watch every day in a ‘hands on’ type of way. Trevor grew up across the street from me and he was like a ‘big brother’. 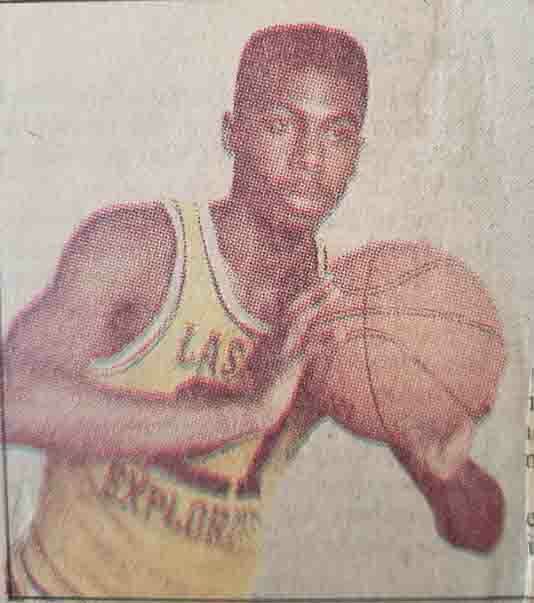 He played at the University of Hawaii and he went on to the NBA, but I didn’t look at him that way. This was the guy who, when he was in the NBA, would pick me up to go work out with him. We had that type of relationship where he was my big brother, and I was going in the house and watching TV with him. 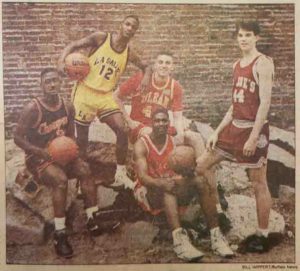 AD: Were you familiar with some of the other Yale Cup and Section VI stars who came before you like Ritchie Campbell and Marcus Whitfield? JR: I grew up watching those guys so I idolized Ritchie, Nigel Bostic, and Marcus Whitfield. I vaguely remember Ray Hall. My experience with him was in the summer leagues. But as far as the big name guys who were in the Yale Cup, I knew them because my cousin, James, was eight years older than me. 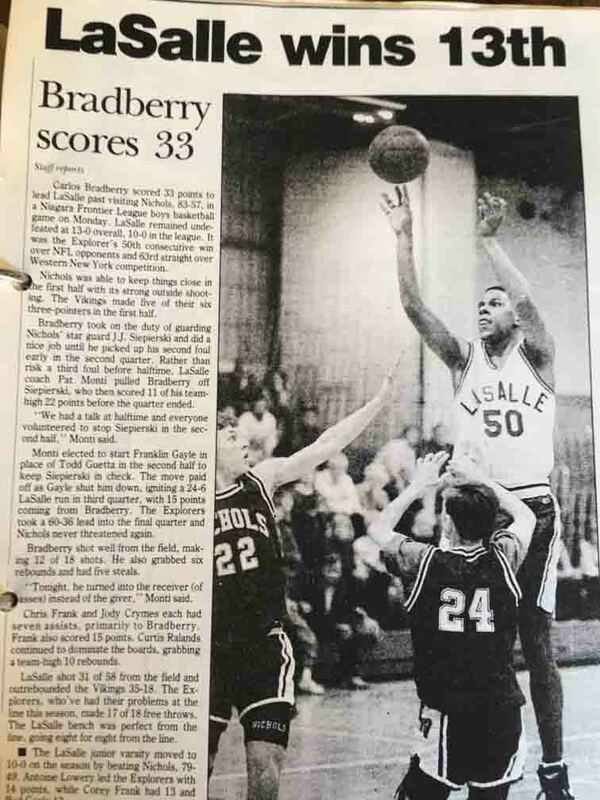 So he grew up in that era and took me to those games because he played at Lafayette. I was able to get my experience watching those games as well. AD: Did anyone in your circle talk about Christian Laettner? JR: I heard stories about Laettner, but I wasn’t around him that much. I was at that infamous game between Nichols and South Park where the fight broke out, but I was too young to remember it. AD: Being at Traditional for middle school, what made you decide to stay for high school? Is that just what the students did there? JR: I wanted to have my own name. Traditional was home for me. They had some success leading up to that time and I knew everyone on their team. I wanted to be a part of that, so for me it didn’t make sense to go anywhere else. AD: Yes, every year Coach Joe Cardinal’s teams were making deep runs in postseason play – a couple of times to the State Tournament. Did you and Damien Foster plan to attend Buffalo Traditional together, or was it a random decision? JR: We grew up in the Masten ‘Boys Club’. The basketball circle is very small. We became friends and started playing there together. I want to say that he was going to go to McKinley first, but he decided to come to Traditional and it definitely worked out for everyone involved. AD: For me, you guys came out of nowhere. I wasn’t in the ‘basketball circle’ you described, and I didn’t know who you guys were. Thus, the first time I saw you play was when you guys came to play us at Hutch-Tech in January 1993 and smacked us 96-73. 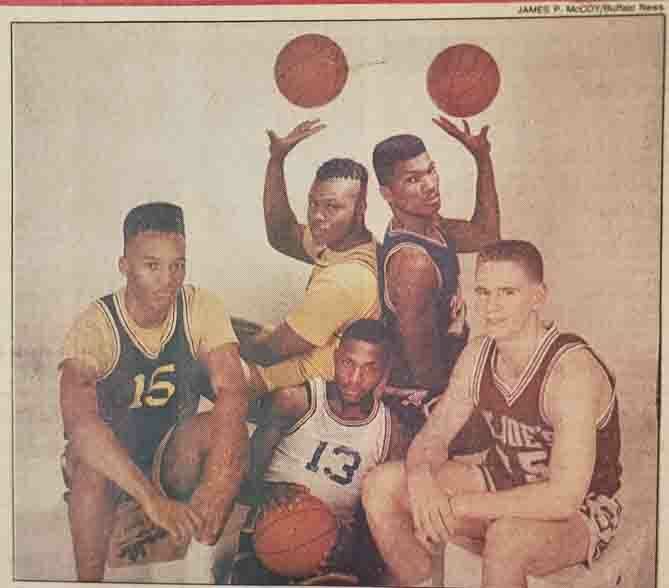 It was right after Cameron Calvin died, and it coincided with the University of Michigan’s storied ‘Fab Five’. We had an all upperclassmen starting lineup and getting routed by you guys like that was a backbreaking loss for the players and our coach. 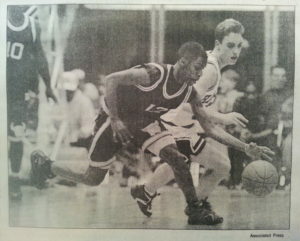 I watched it all unfold on the bench due to an injury, and I even looked at the tape numerous times afterwards in awe. Play after play, you guys just made it look easy. Many freshmen are scared in Varsity competition, but you guys looked so fearless. What was your mentality as a freshman? JR: It’s funny that you mentioned Michigan’s ‘Fab Five’. If you pull up the videos and pictures of us at Buffalo Traditional, we mimicked the Fab Five – the big shorts and the black socks. My mentality personally was to be the best ballplayer I could be. I grew up around Trevor Ruffin and my uncle so inside the home, the pressure to succeed was one of the things that drove me personally. 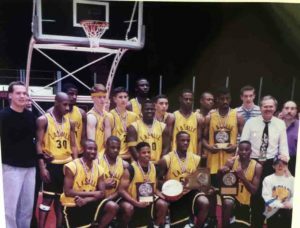 I was fortunate enough to have that basketball success around me – my big brother was an NBA player, and my uncle was a legend who played Division 1 basketball and then overseas. So when you walked into that house you had to bring something to the table. You can’t just sit there and say, ‘I had 10 points today.’ You had to win convincingly and put up some numbers. As a team and as freshmen we were happy to compete and do well, but I don’t think we knew how good we would become and the success we would have. You’re 14 years old and you want to win, but you don’t really understand how far it can take you. AD: I imagine you guys caught a lot of teams like that. Riverside won the Yale Cup the year before, and if I recall you all beat them. You had two seniors on that team, Andre Montgomery and Jeff Novarra, along with you younger guys. How did you guys blend it all together? JR: I was in the school so I was familiar with Andre and Jeff already. They were instrumental in our success my freshman year. Jeff was our shooter, and Andre was like our ‘Draymond Green’ – he was undersized, but he could do a little bit of everything. They were very good leaders. What also helped us was that a lot of us played together outside of Buffalo Traditional. We were always at the Boys Club – myself, Damien, Damone White, who unfortunately has passed away – we were always together playing. It’s kind of like we weren’t surprised because we knew how each other played and our mentality. No one else really knew. We knew how to compete, we just didn’t know we were going to knock off so many teams and make a name for ourselves. We just wanted to win. AD: As you know, whenever you experience a high level of success, you’re going to have critics as well. 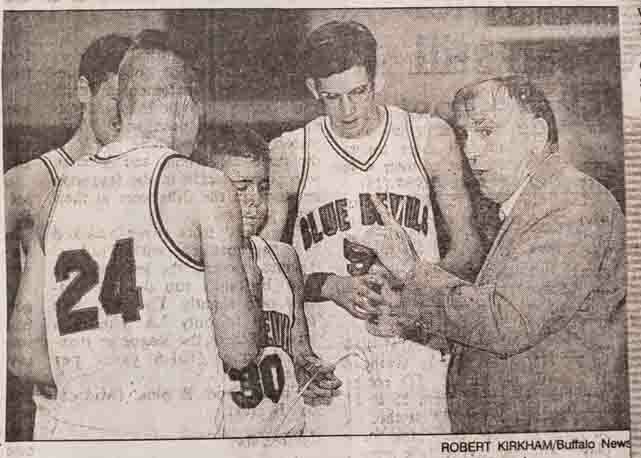 I’m sure you guys heard similar chatter, but one of my teammates at Hutch-Tech once told me about how your Coach, Joe Cardinal, would just go into his office and read the newspaper while you guys played ‘pickup’ basketball during practice every day (laughing). What was the Traditional team like? Was it a thing where Coach Cardinal just put the ball in your hands and let you go or was there more to it? JR: Coach Cardinal was very honest when he would say, ‘I’m a gym teacher, and I don’t know much about basketball in terms of coaching.’ Because he was so open and honest, and didn’t try to hide that, it actually made us closer. He wasn’t lying and trying to be something he wasn’t. 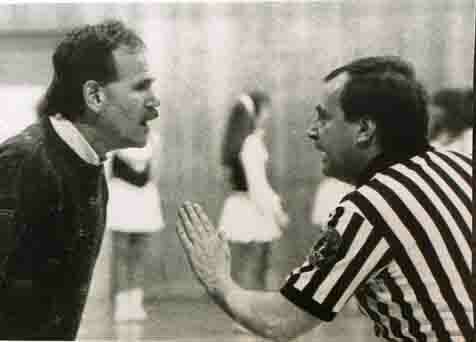 He was the most personable coach I ever played for because he had our backs and we knew that. In terms of Xs and Os, no he wasn’t that knowledgeable so it’s no surprise that we didn’t learn certain things. In tight situations, he would tell us to, ‘run a pick and roll,’ or something very basic – nothing complex. Fortunately for us, we were able to beat a lot of teams by a lot of points, so there weren’t a lot of tight games. When the games were tight I was able to use some of the things my father and uncle taught me. AD: Were there any other coaches on that staff that made a difference? 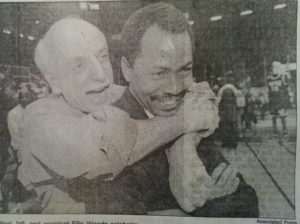 JR: Ellis Woods, who was the coach’s best friend. They were cut from the same cloth, and were very open and honest with us about what they did and didn’t know. 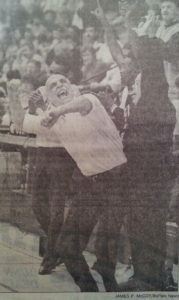 We would run through a brick wall for both Coach Cardinal and Coach Woods. They could relate to us. AD: My junior season was cut short due to grades, an injury and not knowing how to deal with adversity, but I kept my eyes on what was happening in postseason play. 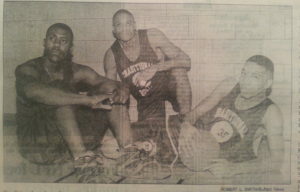 I remember watching the news at night and seeing your team march all of the way to the Class C “Far West Regional”. You guys beat Starpoint, Newfane, Portville and then top-seeded John F. Kennedy 71-67 to win the Section VI Class C Championship as mostly freshman and sophomores. Some kids never made the sectionals at all, and the core of your team won yours as freshmen and sophomores. What was that ride like? JR: Our goal was the win the State Championship. It was my personal goal and the team’s goal as well. When you have that goal, you get that ‘tunnel vision’. We used to say, ‘Get to Glen. Get to Glen. 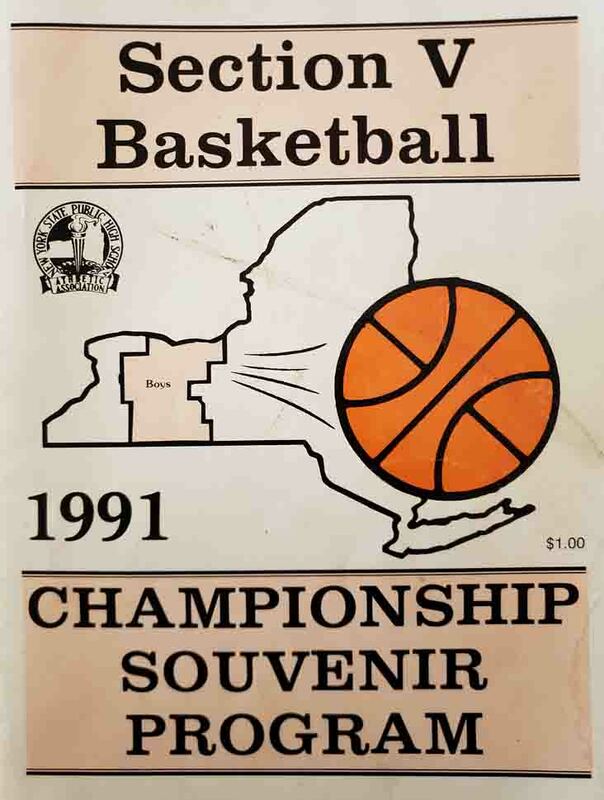 You’ve got to get to Glens Falls.’ That’s where the State Championship was held. For some time the Buffalo teams were having a hard time getting past the Rochester teams in the Far West Regional. We wanted to get past Rochester. For us, we had a lot of confidence because we played against the top notch competition in Buffalo. We were confident enough to get past Buffalo’s competition and we just had to beat the Rochester teams. It was step by step. AD: It was the Marion team in your freshman year and the Mynderse team in your sophomore year you faced in the Far West Regional – were they bigger? Were they better? JR: Everything. I think what we lacked is what they exploited. They had the structure we didn’t have. They were big and physical, and they just outworked us. I cried a lot after those two games. I shed a lot of tears. They were well deserved victories for them. AD: Unfortunately, I didn’t go to that Mynderse game which was at UB’s Alumni Arena, but I did see the highlights and recognized one of the guys Damien Foster was jawing at after hitting a three-pointer. I played with some of those guys at the ‘Ken Jones Basketball Camp’ – my coach’s camp which a lot of Rochester area players attended. I imagine just seeing the clash of styles must have been amazing. JR: You had this fast paced team versus this half court, slow it down type of team – two completely different styles of basketball. AD: Yes, you guys were clearly more athletic and more talented. I imagine they were patiently working the ball on offense, and slowing the game down. JR: They were physical. I remember them being very physical. 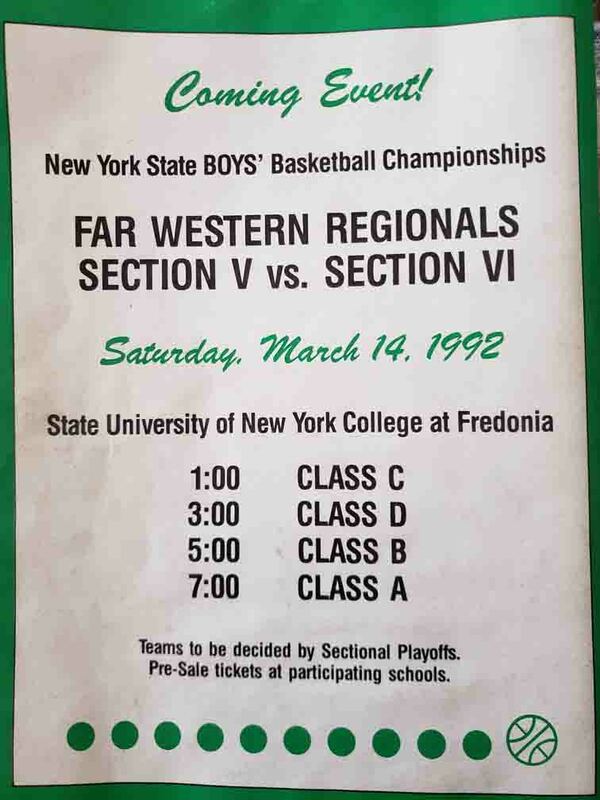 AD: So you guys beat Lyons in your junior year in the Far West Regional 74-71, you willed the Bulls to victory against Mechanicville in the state semifinals 81-72, before matching up against Elton Brand and Peekskill in final game. What was the key to beating Lyons? Had you guys just been there two years and you were ready? JR: I would say that it was the pain of losing in the Far West Regional those first two years and not being able to get over the hump. We felt like it was our time and we wanted that victory more than anything else in the world. Lyons might have been No. 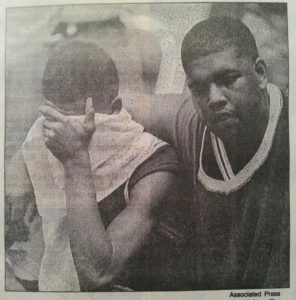 1 in the state that year too, and for a team that was easily motivated like us, we’d had enough. 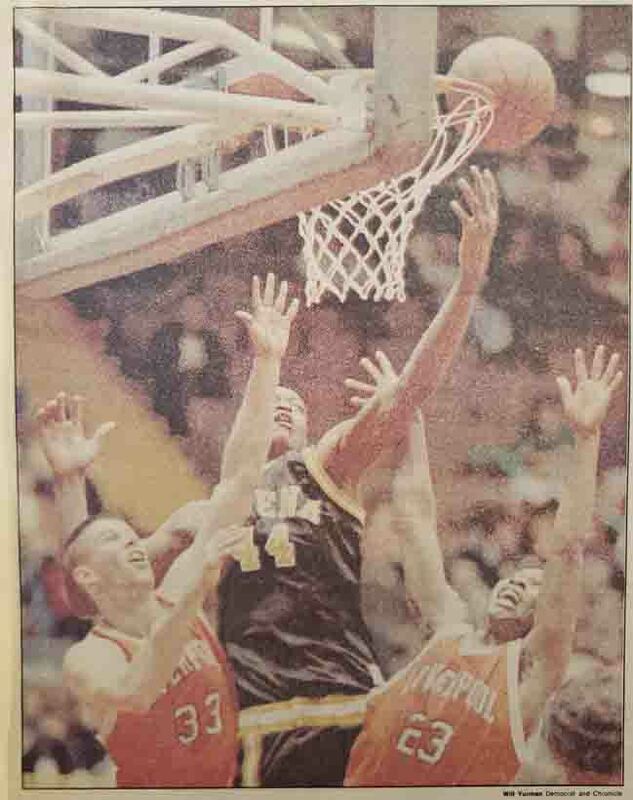 AD: Your team went on to suffer a heartbreaking 94-85 loss to Peekskill in a public state final game, and then you graduated veterans Adrian Baugh, LaVar Frasier and Jimmy Birden who were featured in the Buffalo News during the playoffs that season. Was it hard to get back to the State Tournament the next year? Or did you and Damien just not miss a beat? JR: It was hard in the sense that it’s just not easy getting there period. But in terms of remaining focused and knowing that the State Championship is what we wanted, the mental part wasn’t hard, but the physical part was hard. You have to play 20 games just to get to Glens Falls – that’s just getting there. The game by game process was hard, but the mental aspect wasn’t difficult. 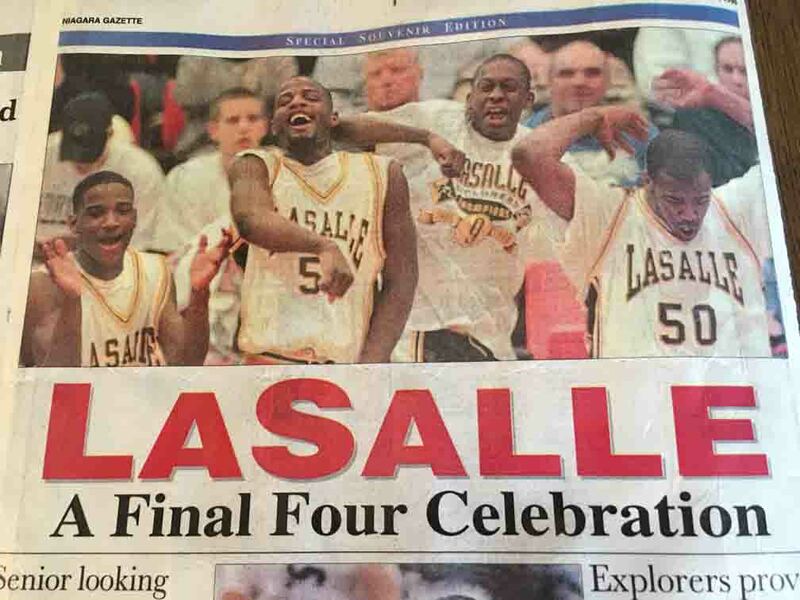 When we lost to Peekskill, I remember telling the Buffalo News before I walked off the court, ‘We’ll be back,’ and I meant that. AD: I imagine all four years were fun, but was there one that stood out above the rest? 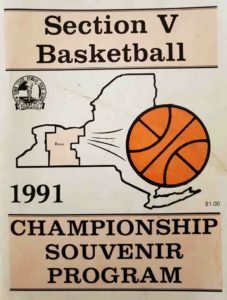 Was it in your senior year when the team won the Class C State crown 62-48 over Mechanicville, and then the Class C Federation crown 92-71 over Collegiate of New York City? JR: Yes, that was the year that we won. It was fun, but it was also bitter sweet, because I remember when we won a lot of us were crying tears of joy, but we also understood that it was over – our run was over and that it was our last game together. Our team was very, very close. AD: As I mentioned earlier, you guys lost the three seniors from your junior year, but you still had a strong supporting cast which included guys like: Damone White, Darcel Williams, Jamar Corbett, and Darnell Beckham. JR: To me Darcel was our ‘X-factor’. We had a good team. We had guys graduate in different years, but everyone stuck together during that time so we already had that bond and that chemistry. So by the time Adrian, LaVar and Jimmy graduated, the other guys were ready because they already had experienced playing in big games. That’s why, in my senior year, we were just running through teams. It was insane. AD: You and Damien were talked about synonymously – Damien Foster and Jason Rowe, Jason Rowe and Damien Foster. What was Damien like? Did you guys have to talk about who was going to get the last shot? Who was going to get the majority of the shots? Was your chemistry just natural? JR: I had two personal goals going into high school; I wanted to get 1,000 assists and I wanted to win the State Championship. 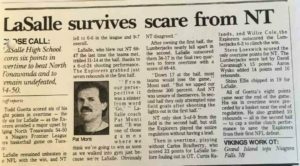 So passing the ball – I didn’t have an issue with that, and fortunately for us, we blew so many teams out that it was never an issue regarding who got the last shot. 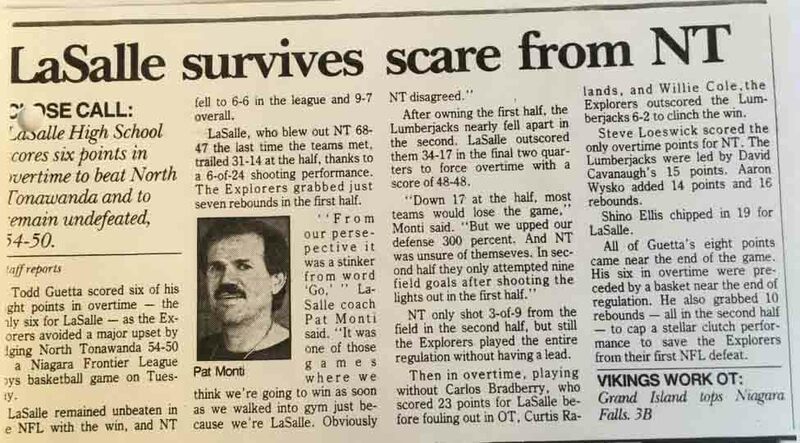 There is no issue when you’re up 10, 20, or 30 points – we won so many games convincingly that we never argued about who was going to get the last shot. Again, I wanted the assist, so on fast breaks I’d throw the ball backwards to set up someone else. 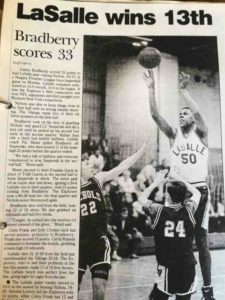 AD: Talk a little bit about the Bennett game in your junior year – the 69-68 thriller where you guys lost to the Tigers. Periodically, I still see guys talking about it on Facebook. Did you overlook them? JR: We didn’t overlook anyone. It’s hard to overlook teams when you go into their gyms and their teams have pep rallies. We knew every team was gunning for us. We knew that we were going to get everyone’s best shot so we came ready to play every single game. That night Bennett played well. It’s a great game and I actually watch it from time to time. It was a great game. AD: Were there any other players that you especially look forward to playing? JR: I liked playing against LaSalle’s Tim Winn, Burgard’s Jeremiah Wilkes, Cardinal O’Hara’s Ryan Cochran, and Turner/Carroll’s Malik Campbell. We were all friends. We would play against each other one day and be friends, and then completely hate each other on the court the next time. We were all very, very, very competitive. When you have competitors competing at that high level, it just makes for some great basketball. 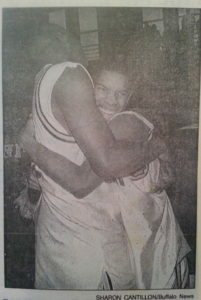 AD: In your junior season, the Buffalo News also wrote a piece actually comparing you and Tim Winn as you two were the top two point guards in Western New York. If I recall, he actually hoped to team up with you in Empire State Games at one point. 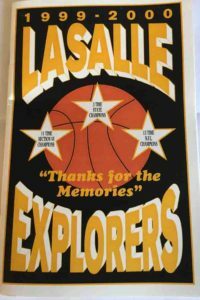 Did your two teams ever match up allowing you to go head to head – Buffalo Traditional vs. LaSalle? JR: Tim was hurt when we were supposed to play. That was a game everyone was looking forward to, and he had sprained his ankle the week of the game in practice. 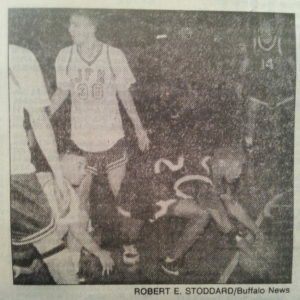 In the second part of our interview, Jason and I discuss his basketball career after being a Buffalo Traditional Bull. I want to thank Jason for taking the time out of his busy schedule to participate. 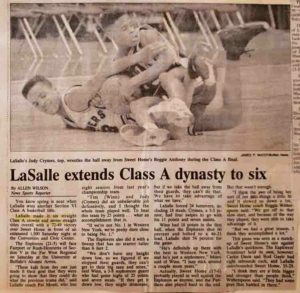 After completing this interview, I realized that there are other historical significances to what we discussed here, beyond the basketball court. Just as the city of Buffalo has changed since the early 1990s, so has its school system. Two schools that were a part of our Yale Cup of the early 1990s no longer exist. One is Kensington High School. 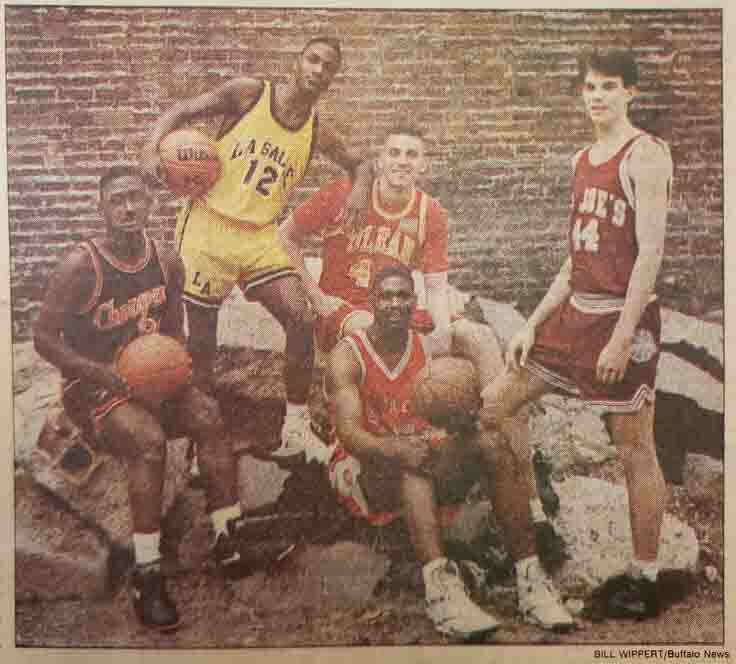 The second is Buffalo Traditional High School where Jason played. While the building still sits there on East Ferry Street, it is now the home for the Buffalo Academy for the Visual and Performing Arts.